This post shows how to install Fire Starter on Amazon Fire TV 2014 and 2015. Amazon released the all new Fire tV 2015 with 4K video, Fire OS 5, and a bunch of problems. One of the major issues with Fire TV 2 is that it kills the ability to create a working shortcut on homescreen for Kodi. This has annoyed many users, who now have to go to Settings -> Applications -> Managed Installed Applications to start Kodi. If you have known Amazon Fire TV then you may also know that opening sideloaded apps are not easy. You can install FireStarter on Amazon Fire TV and circumvent many of these annoyances. Update (Apr 5, 2016): If you already updated to Fire OS v5.0.5.1 then FireStarter will not work on your Fire TV, since Amazon blacklisted FireStarter. However, this version of Fire OS will add sideloaded app icons to "Recent Menu" on homescreen, making launching apps like Kodi easier. Update (Dec 22, 2015): There is now an easier method to install FireStarter on Fire TV without adbFire, ADB, or an external computer. All you need is your Fire TV that is all. FireStarter is an alternate launcher for Fire TV. It detects home button presses and presents to you with an app drawer screen that provides easy access to all sideloaded apps and optionally system apps. When you press the home button FireStarter automatically displays the App Drawer to open sideloaded apps, as shown above. You can also make FireStarter display System Apps such as Prime Videos, Music, Photos, etc. if you Amazon Prime User giving you an Android-like interface to access all your apps. Best of all, FireStarter works without having to root your device. All features of FireStarter can be found on its GitHub page or this XDA thread. Update July 10, 2016: adbFire is now known as adbLink. In this article adbFire refers to adbLink. 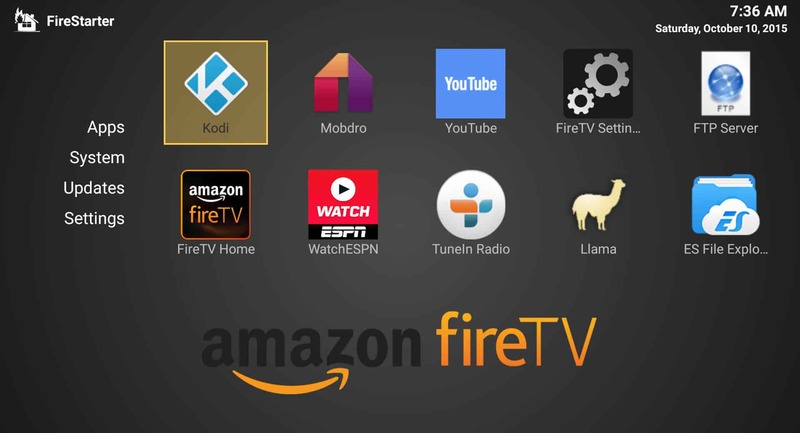 The easiest way to setup FireStarter on FireTV is using the adbFire App. First, ensure that you have setup your Fire TV on adbFire app. With the current device selected and connected, click FireStarter button. This should install FireStarter on Fire TV in a few seconds. However, I found that the adbFire app installed an older version of FireStarter that was not compatible with Fire OS 5. This may change in future when adbFire App is updated. The new adbFire 2.0 version installs the latest FireStarter. But I still recommend following method 2 described below to install FireStarter on new Fire TV 2015 to always get the latest version. 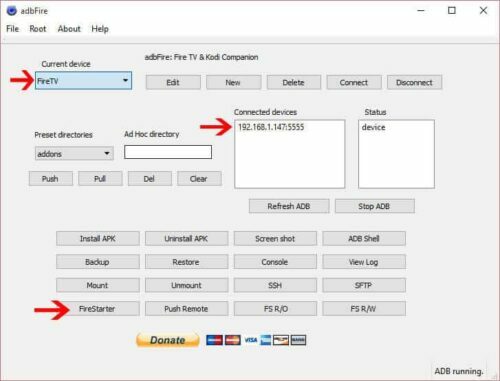 Installing FireStarter on AFTV with this method will ensure that you have the latest version of FireStarter. First, visit the FireStarter download page and download the latest .apk file. At the time of writing this guide it was v3.0. Save it to a known location on your computer. 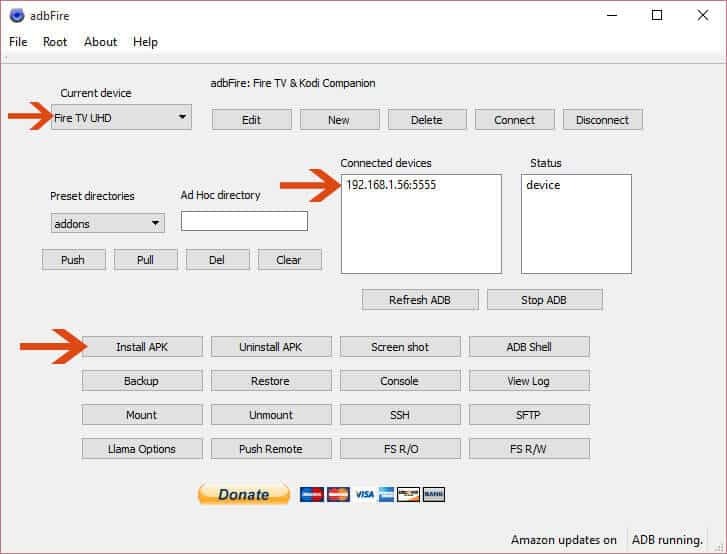 Next, open adbFire app and connect adbFire to your Fire TV. Click on “Install APK” and browse and choose the FireStarter APK file downloaded previously. After successful FireStarter installation you should see a confirmation message. 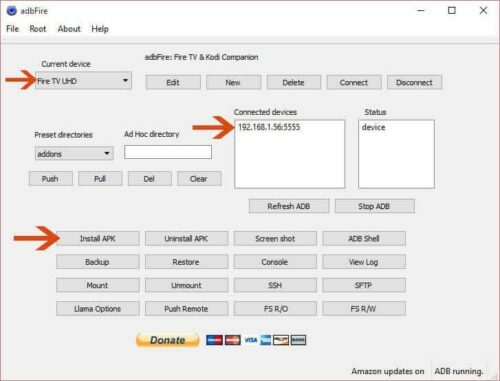 After you install FireStarter on Amazon Fire TV, disconnect your FireTV from adbFire App. 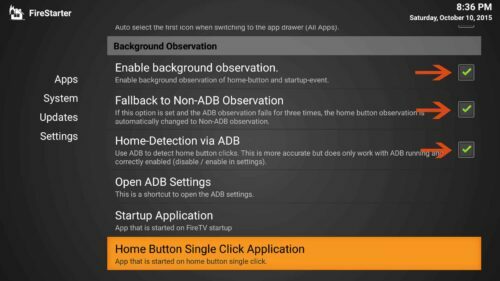 FireStarter cannot function properly if adbFire connected to your Fire TV through adb. Then, navigate to Settings -> Applications -> Managed Installed Applications and open FireStarter. This should be last time you have to open any sideloaded app with these many clicks. That is it, you have now installed and configured Fire Starter for Fire TV. This method also works for Fire TV stick. FireStarter provides quick access to Amazon Fire TV apps. With Kodi homescreen shortcut not functioning (at this point) in Fire OS 5, FireStarter is the best way to not only launch Kodi but also any other sideloaded app easily. Go ahead install FireStarter on Amazon Fire TV and enjoy the added convenience.